These are very high quality, extra-heavy duty, double-draw soap nut wash bags. 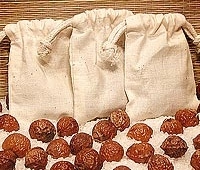 They are far superior to the wash bags that commonly come with soap nuts. Each bag is constructed of heavy muslin and stitched up both sides (not a single stitching with a single draw). They are easy for tying and untying like shoestrings. Rest assured they will hold up under even heavy washing conditions, and last for many, many loads. We are still using our first ones!